Definition of Spiritual Journey: What is Spiritual Journey? A Spiritual Journey which is also referred to as a Spirit Journey is undertaken for various reasons including a rite of passage ceremony known as a Vision Quest, help and guidance from the spirit world, Spiritual Healing, inner exploration, personal growth and direction along the path of life. A spiritual journey, or Spirit Journey is often undertaken by a Medicine Man or Shaman in order to communicate with the spirit world. 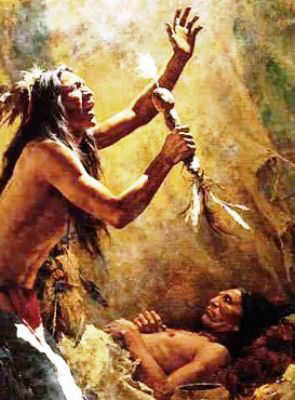 A Medicine Man will undertake a spiritual journey as one of the rituals he undertakes to protect men from evil spirits - his role is that of opponent to the bad spirits and the guardian of the ordinary man. Every spiritual journey is a quest, a search for help and answers. A spiritual journey undertaken by a Shaman was sometimes accompanied by the inducement of a Trance State for the purpose of attaining guidance or knowledge from supernatural forces or spirits. Natural Herbal Herbs strongly feature in the ceremonies and rituals of Native Americans, such as the Spiritual Journey, and used for their hallucinogenic and narcotic properties to alter consciousness, induce Trance States, for spiritual experiences and rites of passage rituals, such as Vision Quests. The herbs and plants used to induce the trance state included Mescal, peyote cactus, thorn apple, psilocybin mushroom, green tobacco, jimsonweed and devil's weed. The trance state allows the Shaman to project his spirit out of his physical body while he is still awake. This trance state might be accompanied by a strong numbing sensation or experiencing the sensation of being in two places at once. A spiritual journey might also be described as a highly focussed day dream. The spiritual journey of a Native American Indian is inspired by his ability to visualise the path that the spiritual journey must take. The Shaman must find a special passage that will take him from the earthly world to the spiritual world of the Supernatural. The passage or path that he must follow on the Spiritual Journey is visualised by the Shaman. The Spiritual journey, or Spirit Journey, is visualised as a the route that is taken to the Spirit World. This might to take the form of an entry into a cave and a route via the tunnels of the cave moving deeper down toward the exit from the earthly realm and entry to the other world. The Spiritual Journey is often accompanied by the pulsating, steady and highly monotonous beating of drums. The darkness of the spirit tunnels lead to the entrance to the 'other world' where the spirit seeker emerges into the light. The Shaman observes his surroundings in the greatest of detail. All the elements of the landscape are taken as a whole and then his attention is directed towards minute details of plants and trees. As he glides through his effortless spiritual journey he might encounter spirit animals. Those undertaking a Spiritual Journey was on the world of spirits in which his vulnerability and the presence of the unknown opened the soul to the Great Spirit (Great Mystery). A Guardian spirit is usually manifested as a literal vision or an intuitive revelation, perhaps triggered by a thought. Power Animals, or the less powerful plant Spirit Helpers, might present themselves on the Spiritual Journey. The Spirit Animals or helpers are believed to be a supernatural power that embodies, attaches or conveys influence empowering a person with the powerful traits and characteristics of the animal. These tutelary spirits, are believed to empower and protect them from harm, like guardian spirits or angels. The spirit of the Power Animal lends the Shaman with the wisdom of its kind, acting as a teacher to help him provide solutions to the problems being experienced by the tribe or how to use its powers to heal the sick. The Shaman will then undertake his spiritual journey home. He returns to the point of entry to the 'other world' and passes along the spirit tunnels to the earthly world. 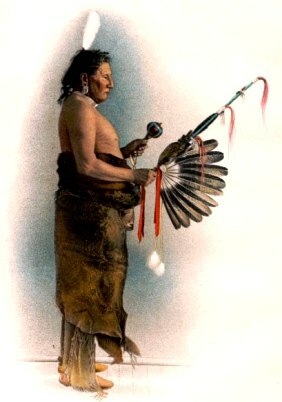 At this stage he emerges from his trance-like state and signals to his aide, who strikes a drum very rapidly for about a minute to announce the return of the Shaman. The drumming concludes with four abrupt strikes of the drum to signal that the Spiritual journey is over and the Shaman opens his eyes. Spiritual Journey. Discover the vast selection of pictures which relate to the History and Culture of Native Americans. The pictures show the clothing, War Paint, weapons and decorations of various Native Indian tribes that can be used as a really useful educational history resource for kids and children of all ages. We have included pictures and videos to accompany the main topic of this section - Spiritual Journey. The videos enable fast access to the images, paintings and pictures together with information and many historical facts. All of the articles and pages can be accessed via the Native Indian Tribes Index - a great educational resource for kids.